If you are using Twitter as a marketing tool that points followers to your Blog, HootSuite lets you alert your followers automatically when you update your blog. This is a real timesaver for Twitter marketers. Automating the blog post in HootSuite simply means that when you post a new blog post to your site, HootSuite automatically posts the blog to your different social media accounts (mainly Twitter). Go to your HootSuite dashboard. Click the owl head in the upper-left corner of your screen. A settings box appears over your screen listing. An Add New Feed button appears at the bottom of the box. Click the Add New Feed Button. Copy and paste your feed URL to the specific box. Find out how to find your RSS feed by visiting this How to Find an RSS Feed on a Website. Choose the account you would like to share the blog post. 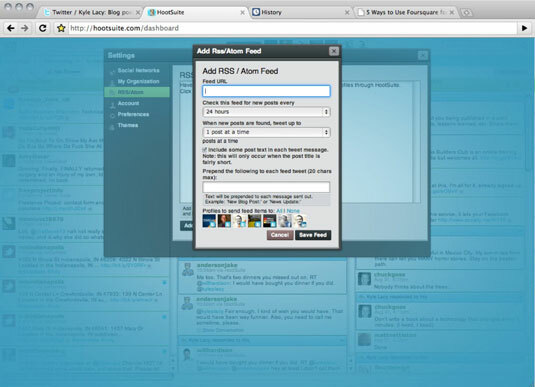 Now you are ready to share your blog post on Twitter, LinkedIn, and Facebook through HootSuite. It is also completed automated! You can also use HootSuite and the blogging tool to update LinkedIn, Facebook, and Ping.fm.